Loft Bed Dimensions are generally twin loft 39 inches x 75 inches, twin XL loft 39" x 80", rarely, Queen loft 60" x 80" and more rare yet Full XL loft 54 inches by 80 inches. These are fairly standard loft bed measurements. Loft Mattress depths can vary from just a few inches to 8" or more, very dependent upon the height of the safety rails. 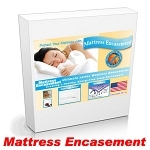 Many times, actual loft mattress dimensions will vary by one or two inches, usually smaller. A cousin of the bunk bed, the loft bed has a number of advantages over a standard bed. Loft beds help to maximize the usable space in a room without sacrificing comfort. Loft beds are available at many quality furniture outlets and can even be a do it yourself project. The driving design principle behind the loft bed is to provide a comfortable sleeping space, with room under the bed available for other uses. Most often that space is used for a desk, storage furniture like dressers and chests or even a small couch or futon. Available in wood or metal, loft beds are a favorite among many college students. Many colleges and universities require students to provide loft beds for their dorm rooms. When traveling around looking at various schools with my son, it was very common for advisors to provide a set of exacting specifications for a loft bed. One sure sign of summer’s end was a line of cars at the local home improvement center, each with a load of lumber strapped to the hood. Like a caravan of nomads, parents would dutifully travel down the interstate to the university, each dreading the hours of work needed to assemble a proper loft bed. The price of lumber and hardware rising and the time required to build a loft bed from scratch getting harder to find, the solution is obvious. Quality pre-engineered loft beds are easy to assemble and cost less than starting from scratch. Manufactured loft beds come in a variety sizes and materials. Loft beds come in sizes ranging from twin, full and queen size. Some loft beds can even accommodate extra long mattress sizes. Loft beds are not just for college dormitories anymore. Any bedroom or sleeping space can benefit from the addition of a loft bed. Kids from six to sixteen can create a truly unique space that is both fun and functional. Many loft bed designs feature storage space, drawers and even lighting. Loft beds can even provide space for an additional bed and still have enough room for storage.